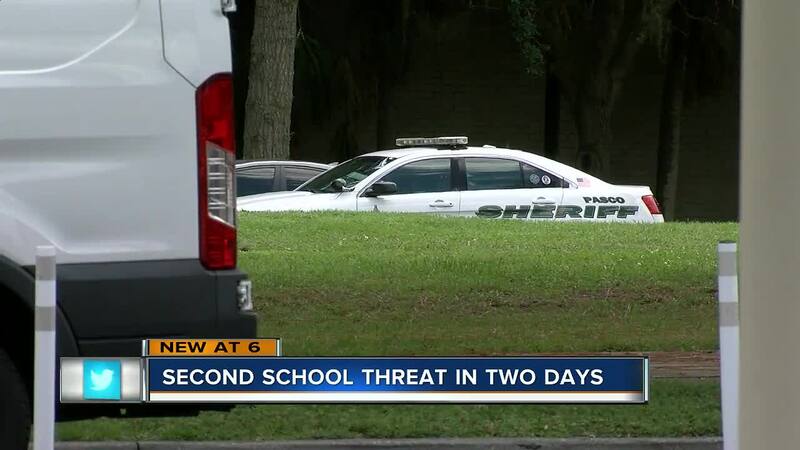 PASCO COUNTY, Fla. — A second school threat in the Bay Area has parents and students concerned just days into the new school year. On Thursday a Pasco County school issued tighter security after a threatening message was left on a bathroom wall. After the Parkland school shooting that killed 17 in February school, safety is a huge issue and threats are not something parents or students want to deal with in the first week back to school. "What’s going to happen throughout the rest of the year if it's already happening on the fourth day of school?" said River Ridge High School freshman Connor Taft. After a threat was found written on a bathroom wall River Ridge Schools in Pasco County deputies searched and monitored the school. "Considering I didn’t get notified or a phone call or anything, I’m not exactly too happy," said parent Mercedes Dolly. Dolly says her daughter is deaf and she’s concerned about her child’s safety. "My daughter can’t hear anything, what is she going to do? Stand there while everyone else is ducking and not know what’s going on?" said Dolly. These threats are unfortunately a continuing trend from the end of last school year. Polk County says between January and June of this year, they had seven school threats. Tampa schools had six threats during that same time, and Hillsborough County had six threats just between January and March. We reached out to other counties but have yet to hear back. Law enforcement warns that school threats are not taken lightly and will result in very serious charges.